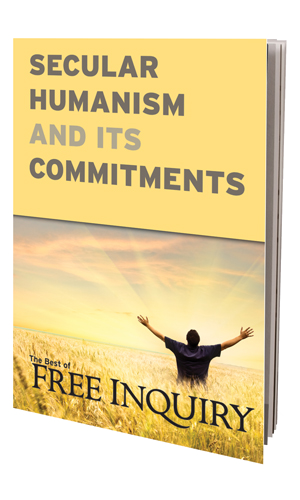 The third in a series, this new anthology collects outstanding articles from the prior decade of Free Inquiry, America’s definitive secular humanist magazine. Yet another selection of thirteen hard-hitting essays surveys the harm done by religion—to individuals, peoples, and societies—by a variety of faith traditions and at varied times and places very much including … but not limited to … the here and now. 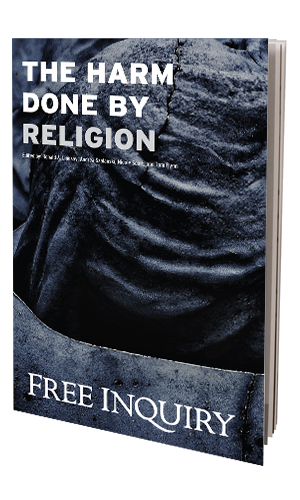 Christopher Hitchens | Richard Dawkins | Peter Singer | Barbara Smoker Gregory Paul | Lisa Bauer | James A. Haught | Kristi DeMeester | Beth Birnbaum and others chronicle the harm done by religion. Christopher Hitchens suggests that across too much of the world the most religious places are the least safe to live or visit, and explains why public school districts in the United States should not attempt to recognize the holidays of every faith held by some within the human community. Peter Singer offers a case study of the G. W. Bush Administration’s 2001 decision to limit stem cell research on veiled religious grounds, which has arguably delayed the achievement of medical breakthroughs to this day. 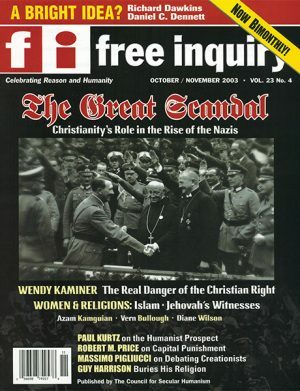 Gregory Paul details the sinister deal-making by which Hitler bought the silence of Germany’s Catholic and Lutheran churches, clearing the way for the murderous madness of Nazism. Lisa Bauer offers a searing first-person account of the sexual, psychological, and intellectual abuse she suffered as an American convert to Islam. James A. Haught calls out the financial rapaciousness of American televangelists who fleece their flocks in Jesus’s name. Kristi DeMeester explains the lifelong impediments that came from growing up in a Christian sect that denied children access to computers. Discover how toxic faiths work their social and intellectual evils. Celebrate those among the victims who have been able to overcome the impairments that struck them because of misplaced faith. 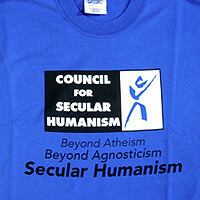 It’s all in THE HARM DONE BY RELIGION, from the credos to the damage done.